I earned my MBA from CU Denver in 2014 and also completed my undergraduate degree from CU Boulder in 2009. My career has taken me (both in Denver and abroad) from Marketing to Human Resources to Strategy to Project and Change Management, complete with a short detour in Finance. Whew! This past year, after being laid off from a job that I was lukewarm about, I decided to enter the completely foreign land of entrepreneurship instead of restarting the routine of emailing resumes. I came to this conclusion after reviewing a few job postings and even going on a couple of interviews that all left me less than excited. I had known for a long time that I wanted to work with older adults, inspired by the time I spent caring for both of my grandparents at the end of their lives. I just didn’t know how. I started by volunteering with a couple of local organizations, A Little Help and Project Angel Heart and was struck by my idea! I wanted to be a personal chef for older adults. I would go into people’s homes once a week and spend time with them while I prepared their food for the week. I was so inspired that I dove right in – filed my LLC, got a logo made and started a website. But then I got stuck…I had so many ideas and I was getting a little confused and overwhelmed. 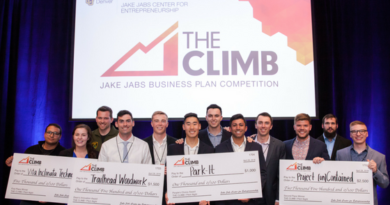 As an alumnus of CU Denver, I receive emails about the various goings on on-campus and I opened an email with a link to RSVP for THE CLIMB, the Jake Jabs Center for Entrepreneurship’s annual business plan competition. Ah ha! This would help me get my ducks in a row AND there was some money in it for me if I did well enough. I was, and still am, very nervous about marketing my business (and therefore, myself) so even entering the competition was pretty scary for me. At the Jabs Center’s Spark Social Happy Hour, I had the honor of meeting two folks from CONCEPT2EXIT, a local entrepreneur-consulting firm. Robert and James (and their families) were absolutely instrumental in helping me prepare my pitch. I also worked with the Denver Small Business Development Council. The ideas we worked through for the pitch are some ideas that I’m still implementing in the business today. 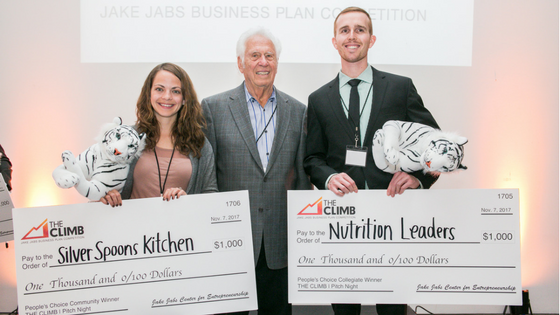 I was so nervous to pitch my idea – my baby – but it was an incredible experience. 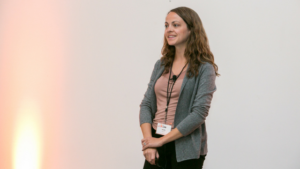 The crowd at THE CLIMB was so positive and supportive, and it felt like the perfect place to speak publicly about my venture for the first time. I was the People’s Choice Award Winner and walked away with a giant $1,000 check that I’m still trying to convince my bank to accept as a deposit. I’m still working on Silver Spoons Kitchen and having a lot of fun learning and watching it grow. To me, entrepreneurship is all about possibilities. No matter what happens, I’ve experienced and grown a lot in a short time – in ways you just can’t from a traditional job. If you have an idea, go for it! Filing an LLC only takes $50 and about five minutes on the Colorado Secretary of State’s website. The best way to learn is by doing, so don’t wait until you have everything perfect (spoiler: you never will) and just go for it. Bring your idea to market, test it, get feedback, make tweaks and grow! Denver is a really great community for startups, there’s always someone willing to help you and talk you through it. 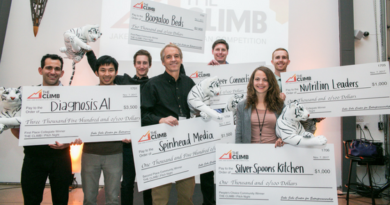 You should absolutely apply for THE CLIMB – you’ll meet lots of supportive people along the way, and it’s a great kick in the pants to get going and firm up your idea.